Donald R. Rasley, 63, of 981 Windemere East, Venice, Fla., formerly of Line Street, Easton died Thursday, Oct. 4 (2001) in Venice Hospital, Venice, Fla. He was a correctional officer and firearms instructor at Mountainview Youth Correctional Facility in Annandale, N.J., for 28 years, retiring in 1994. Born Aug. 28, 1938 in Easton, he was a son of the late Raymond and Sarah Smith Rasley. He was a former member of St. Paul's lutheran Church in Easton.He was a member of the Loyal Order of Moose in Venice and a life member of Citizen Hose Co. in Easton. He and his wife, the former Diane Trumbatore, observed their 45th wedding anniversary March 10. 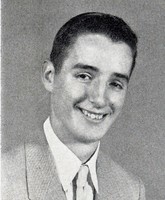 In addition to his wife, he is survived by a son, Donald of Forks Township; two daughters Lorraine Hendershot of Easton and Connie Febus of Middletown, Pa.,; three brothers, Ronald of Easton, Raymond of Wilson Borough and Carl of Phillipsburg; three sisters, Shirly Faulstick of Easton, Ruth Stein of Quakertown, Pa., and Kathy Stoker of Mesquite, Texas; five grandchildren and a great-grand-child. Burial will be in Plainfield Cemetery.